Plug-Ins: "Batch Publisher" - Open Text Web Solutions Usergroup e.V. Batch Publisher™ provides a convenient way for content class based page batch publishing in RedDot CMS, which is designed to componentize a Web site by way of content classes. When a specific portion of the site gets updated, either in terms of function or look and feel, the change is not reflected on the live site until the affected files are published out. Batch Publisher™ provides a convenient way for content class based page batch publishing in RedDot CMS. In SmartTree, RedDot CMS does provide a way for a site administrator to traverse the collection of page instances pertaining to a specific content class, albeit with a maximum of 200 pages returned. RedDot CMS, however, does not provide a way for the site administrator to publish out those returned pages in batch fashion. Publishing those pages out means that the administrator has to select and publish those pages one by one. 1. 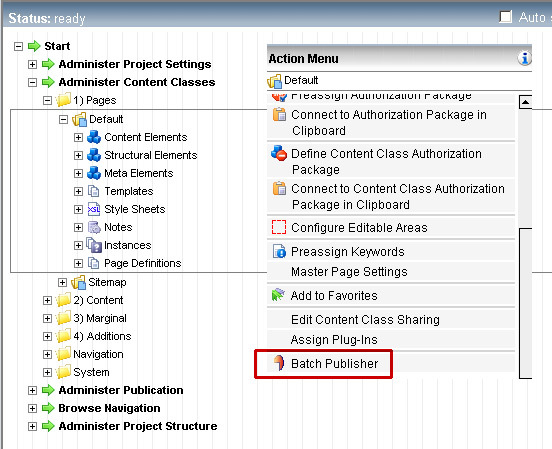 The user interface of Batch Publisher™ is self-explanatory. The moment you drill down the “Administer Content Classes” node to the content class you want to work with, you will see Batch Publisher™ at your fingertip. 2. Feature rich. Sorting and selection in Batch Publisher™ is a breeze. You can control select and shift select. You can also sort the pages by headlines, page ID or page timestamps. 3. Exhaustive project variant and language variant configuration. Publication is an asynchronous process and the completion status cannot be obtained instantaneously. You are encouraged to check logs or read email notifications generated by Batch Publisher™ in order to check the publication status of particular batch jobs. Please bear in mind that such logs or emails will come with due time delay. 1. RQL Error Code # 401 ( #RDError401 ) -- Project locked for user or user level. <faultstring>System.Web.Services.Protocols.SoapException: Server was unable to process request. ---&gt; Reddot.CMS.Rql.RqlException: The project has not been released for publication. The job could not be entered in the list of the asynchronous processes. 2. RQL Error -- Reddot.CMS.Rql.RqlException: Page/link is already waiting to be published. This error appears to be one of those undocumented RedDot CMS RQL errors and therefore there is no known RDError code. <faultstring>System.Web.Services.Protocols.SoapException: Server was unable to process request. ---&gt; Reddot.CMS.Rql.RqlException: Page/link is already waiting to be published. 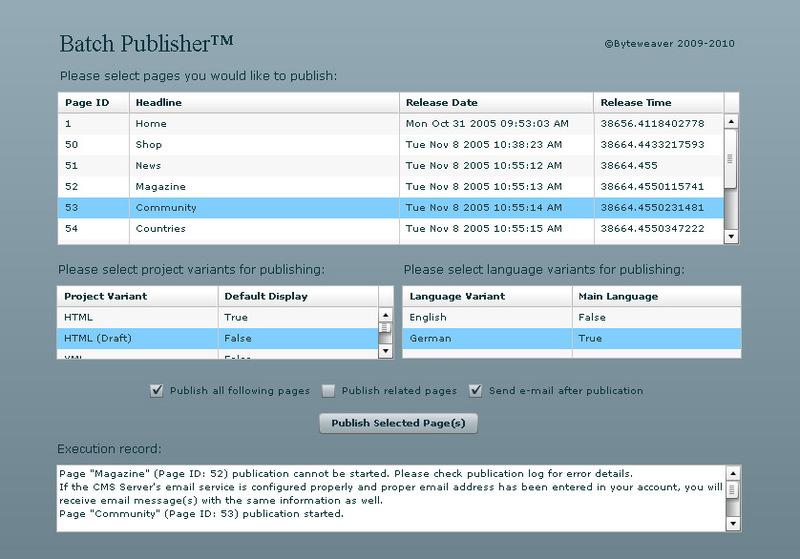 No special run-time or application is required for Batch Publisher™ to run. And the installation is that of the easy, standard issue RedDot CMS plug-in routine. Unzip the folder and make sure you uncheck the "read-only" property that is applied to the folder by default. Move the folder into your \CMS\asp\PlugIns\ folder on your CMS server. Access the Plug-in Management Interface via Server Manager and import Batch Publisher™. Log in CMS users can access Batch Publisher™ from Server Manager main node, SmartTree main node, Administer Project Structure node and "Action Menu" in SmartEdit when a page is opened. Need a detailed guide on installation? Read our tutorial on How to Install A RedDot CMS Plug-in. Voila! You will have a fairly sophisticated yet light-weight batch publication plug-in running in your CMS in no time!